ARIFJAN (KUWAIT): Nasser Saleh Al-Attiyah emerged relatively unscathed from one of the most action-packed days in the recent history of the FIA Middle East Rally Championship (MERC) to hold an outright lead of 8min 03.9sec in the 25th Kuwait International Rally on Friday. The first loop of three of the day’s six timed special stages in the deserts south of Kuwait City decimated the field and a mere four FIA cars and one entrant running in the National Rally completed the entire day’s route. Kuwaiti driver Meshari Al-Thefiri remains firmly on course for a fourth MERC 2 or Group N showroom title. 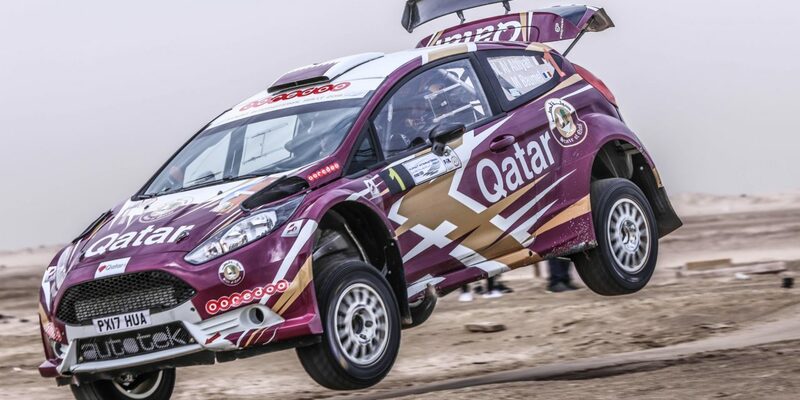 He and Qatari navigator Nasser Al-Kuwari overcame a minor scare before service and a drive shaft failure on the last stage to finish the day in second position. Lebanon’s Henry Kahy and Jordanian navigator Musa Djiyerian survived the carnage around them to hold an unlikely third overall in a two-wheel drive Škoda Fabia. The points earned guaranteed the 2018 MERC 3 title for ‘Henry the Third of Kuwait’ and his delighted navigator. Nasser Khalifa Al-Attiyah, the former QMMF President and FIA Vice-President, continued his impressive return to competitive action and looked to be heading for third overall at the end of the day. But the Qatari suffered a cruel mechanical issue on the last stage and slipped into Rally 2 territory. The Kuwaiti pairing of Jassim Al-Muqahwi and Tamer Al-Mutairi were the only crew to complete the day’s action in the National Rally category. Vojt?ch Štajf’s MERC title challenge was hanging by a thread after the Czech driver badly damaged his Škoda Fabia R5 on the fourth stage and slipped from second to fifth overall. His crew faced a race against time to repair the R5 in time to start Saturday’s stages under Rally 2 after the Czech had stopped again after losing his way on the fifth special. The rate of attrition was high on the first loop of three stages with all but six of the FIA entrants and two of the National Rally cars retiring prematurely. Drive shaft issues accounted for Rashed Al-Nuami and Ihad Al-Shorafa, engine woes plagued Shabi Shaban and electrical gremlins sidelined Abdullah Al-Ruwahi. Fuel feed issues caused by a blown fuse robbed Khaled Juma of a potential fourth place after the regroup. 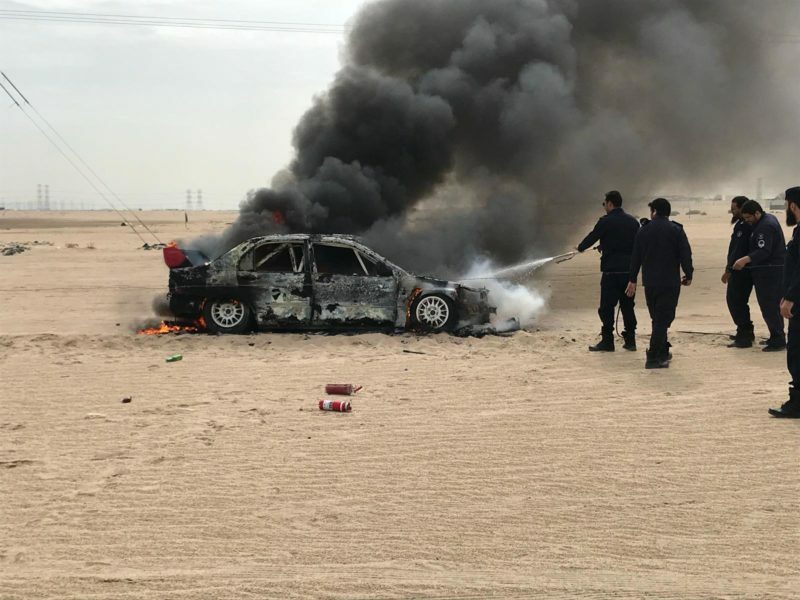 Fire destroyed Salem Al-Thefiri’s car in the Kuwait National Rally. This year’s event is being organised by the Basil Salem Al-Sabah Motor Racing Club (BMRC) under the chairmanship of Sheikh Athbi Nayef Jaber Al-Ahmad Al-Sabah and in conjunction with the General Authority for Sport and the Kuwait International Automobile Club (KIAC). Zain Kuwait is the main sponsor. The brand new KMT special opened proceedings for the 10 FIA crews and three national teams and overnight leader Al-Attiyah led the way into the sandy 15.10km special. The Qatari carded the target time of 7.21.8sec and that was sufficient for the Ford driver to extend his overall advantage over Štajf to 17.3 seconds. At one point, around 10km into the special, he was recorded on the event’s tracking flat out on the rev limiter at over 180km/h. Al-Thefiri finished the special 48.2 seconds ahead of Juma to extend his MERC 2 advantage, but driveshaft problems sidelined Qatar’s Rashed Al-Nuami, who started the day in sixth overall. Nasser Khalifa Al-Attiyah climbed to fourth at the expense of the Jordanian, but Al-Rawahi continued to haemorrhage time with a misfiring Subaru – a problem that had persisted since the Jordan Rally – and he retired after the stage finish. The runners in the National Rally were whittled down to two when Salem Al-Thefiri’s Mitsubishi Lancer Evolution VIII was destroyed in a fire. Neither crew member was injured. The Jordanian duo of Ihab Al-Shorafa and Shadi Shaban also suffered drive shaft and engine issues and retired their respective Mitsubishis after the finish of the stage. The Nuwaiseeb stage (18.22km) was next on the agenda and Al-Attiyah stopped the clocks in 9min 44.6sec. His Czech rival ceded further time and the Qatari found himself leading the rally by 1min 04.3sec, despite complaining that it was quite difficult to find the correct line on the virgin sand. Al-Thefiri was second quickest and moved 1min 36.3sec ahead of Nasser Khalifa in the MERC 2 battle. Crews tackled the longest stage of the rally – Al-Zour (22.46km) – before a return to Kuwait Motor Town. Only six FIA entrants and two national runners survived the opening two stages to tackle the special. Al-Attiyah safely negotiated the opening loop with a fourth stage time of 14min 15.7sec, but the Qatari finished the special with a flat tyre sustained after he clouted a sand bank seven kilometres from the stage finish. Al-Thefiri finished the special 39.6 seconds adrift to move in front of Štajf at the midday break, after the Czech rolled on the stage, was passed on the special by Juma and the Fabia R5 sustained substantial front-end damage. He dropped five minutes in the special and slipped to fifth overall behind third-placed Nasser Khalifa and Juma, who was suffering his own serious fuel feed issues. Mohammed Al-Thefiri left the fray at the end of SS3 and paved the way for Jassim Al-Muqahwi to be the only survivor in the National Rally category. The re-run of the KMT stage followed in warm, overcast conditions. Al-Attiyah was nine seconds slower than he had been in the morning and the Qatari stopped the clocks in 7min 30.1sec. His outright lead was 2min 25.4sec. Al-Thefiri maintained second position with the second quickest time, Nasser Khalifa Al-Attiyah consolidated third, but Štajf lost his way midway through the special, returned to the correct track and then stopped before the finish with technical issues. Henry Kahy duly climbed to fourth overall in his quest to win the MERC 3 title. Just four FIA cars and one National entrant started the re-run of Al-Zour (SS6). Al-Attiyah completed the special in 9min 50.1sec, Al-Thefiri maintained second position and Nasser Khalifa kept his grip on third position, despite ceding over two minutes to his rivals and letting Henry Kahy grab the third quickest time, although he ran the risk of time penalties for potential route violations. A second pass through Al-Zour rounded off the day’s action. Al-Attiyah was 28 seconds faster than he’d been with a flat tyre in the morning to confirm an overnight lead of 8min 03.9sec over MERC 2 leader Al-Thefiri after the local driver suffered a drive shaft failure. Kahy was third and confirmed the MERC 3 crown, although time penalties were expected to be added later in the evening when his tracking and stage route information were analysed before the Stewards’ meeting. Nasser Khalifa Al-Attiyah suffered a devastating mechanical issue within sight of the finish and had to face the thought of restarting under Rally 2 on Saturday. The remaining six special stages take place in the southern deserts on Saturday. Two loops of three specials is again on the cards with crews tackling the 11.88km of Bnader from 10.00hrs and moving on to the 13.03km of the Julai’a test at 10.33hrs and the 17.42km of Arifjan from 11.11hrs. After a return to Kuwait Motor Town for a midday regroup and service, the specials are repeated at 13.24hrs, 13.57hrs and 14.35hrs respectively. The podium finish at Kuwait Motor Town is scheduled for 16.30hrs.